Earlier we looked at several clades of pterosaur finger morphologies. Find them here, here, here, here, here and here. Today we’ll look at various Pterodactylus species (Fig. 1), their tiny predecessors and their tiny cousins preceding Germanodactylus (which we’ll consider next). Gmu 10157 – The metatarsus was longer. The digits were shorter. Ungual 1.1 was larger. Compare to the outgroup taxon, Scaphognathus (Maxburg specimen). Ornithocephalus – The digits and unguals were smaller. Digits 1 and 2 were relatively smaller. Manual 3.1 was longer. Manual 2.2 was shorter. No 9 – Th digits were larger and more robust. No 31– The digits were smaller and more gracile. Manual 3.2 was as long as m3.3. Ningchengopterus – The digits were larger, nearly as long as the metacarpus. Metacarpal 1 was the longest. Manual 3.2 was shorter. Pterodactylus AMNH 1942, no 20 – Metacarpal 1 was shorter. The digits were relatively shorter. Pterodactylus NHMW1975 – Manual 3.2 was longer. Pterodactylus scolapaciceps No 21 – Ungual 3 was smaller. Pterodactylus (Frey and Tischlinger private specimen) – The digits were smaller and more gracile. Pterodactylus antiquus (holotype) no. 4 – The metacarpus was more gracile. Diopecephalus, Pterodactylus longicollum, no. 58 – The digits are unknown. The metacarpus was relatively twice as long. No 6 – Compare to the outgroup taxon No 31. The digits were more robust and slightly larger. BMNH 47236 – The unguals were more trenchant. No 12 – The digits were longer. The unguals were less trenchant. Manual 3.1 was longer. No 23 – Manual 2.2 was shorter. Drs. Brian Andres and Ji Qiang (2006) reported on the second specimen ever discovered of the lower Cretaceous ornithocheirid pterosaur, Istiodactylus. The holotype came from the Isle of Wight in England. The smaller Andres and Qiang (2006) specimen was discovered in China. Among the smaller hand elements, only distal metacarpal 4 is known from the English holotype. Thankfully the Chinese specimen preserves two virtually complete sets of metacarpals and fingers. Figure 1. Fingers of Istiodactylus sinensis. Above: As originally interpreted. Middle: Re-identified elements. Below in gray: Reconstructed fingers. DGS (digital graphic segregation) enabled the shifting of elements. This is the only pterosaur known in which the phalangeal formula is 2-2-2 for digits 1-3. Andres and Qiang (2006) reported that only metacarpals 1 and 4 articulated with the carpus. In their view metacarpals 2 and 3 tapered to small points less than halfway toward the carpus. Andres and Qiang (2006) were able to identify the 6 unguals, but only 5 penultimate phalanges. Among the six proximal phalanges typically found in digits 2 and 3 only a single m2.1 was identified. Like all tetrapods, in pterosaurs metacarpals 1-4 were aligned side by side. The only difference is metacarpal 4 rotated posteriorly for wing folding (Peters 2002). Thus metacarpal 3 is between mc2 and mc4. Whenever pterosaur metacarpals do not all reach the carpus (as in Pteranodon), metacarpal 3 is always the longest. The other two metacarpals stack anteriorly 4 > 3 > 2 > 1. Thus the only slender metacarpal that reached the carpus in Istiodactylus sinensis was mc3. It was misidentified as mc1 by Andres and Qiang (2006) probably because associated digits had only one non-ungual phalanx (see below), which is VERY unusual! Both metacarpals 1 were preserved at mid-metacarpus, but no sister taxa share this trait. All other ornithocheirds extend metacarpals 1-3 to the carpus where these elements are known. Thus the displacements were due to taphonomy. Because only one non-ungual phalanx can be identified in digits 2 and 3, evidently the three non-ungual phalanges of digit 3 had fused together. The two non-ungual phalanges of digit 2 had also fused together. The fragment previously identified as m2.1 was actually part of the otherwise missing phalanx of digit 3. Since the non-ungual phalanges had become fused in digits 2 and 3 and thus had become nearly identical to digit 1, matching of the distinct ungual shapes made possible the identification of the digits. Manual 1.1 was also more gracile than the others. This is the only pterosaur known in which the phalangeal formula is 2-2-2 for the first three fingers. A reconstruction of the Istiodactylus sinensis manus (Fig. 1) shifts all metacarpals to terminate in a distal line. Metacarpal 3 reaches the carpus. Metacarpals 1 and 2 stack anteriorly. The fingers, each composed of two phalanges (including the ungual), were subequal in length so the PILs (parallel interphalangeal lines, Peters 2000) were simple and aligned. There’s even a disarticulated vestigial digit 5 here (Fig. 2). More examples of the vestige here. It’s easily overlooked, especially when disarticulated. Figure 2. Vestigial digit 5 in Istiodactylus sinensis. Red = ungual. Green = two phalanges. Blue = metacarpal 5. yellow = Carpal 5. Click to see more examples of this vestige. Most ornithocheirids have digits 2 and 3 subequal with digit 1 shorter. In most ornithocheirids all five metacarpals reach the carpus. No other ornithocheirids fuse the proximal phalanges in digits 2 and 3. Only in Coloborhynchus, a sister to Istiodactylus, does digit 1 equal digit 2 and digit 3 in length. Nurhachius is a closer sister that does not have a subequal digit 1 and all four metacarpals presumeably reach the carpus because metacarpal 1 reaches the carpus while 2 and 3 are largely hidden beneath 4. Thus the misidentification of elements by Andres and Ji (2006) was reasonable, but stands corrected here. Earlier we looked at the evolution of the fingers of basal pterosaurs and dimorphodontids, basal eudimorphdontids, campylognathoides and rhamphorhynchus, and most recently dorygnathids leading to azhdarchids and ctenochasmatids. Today we’ll look at scaphognathids to cycnorhamphids and ornithocheirids. Jiangchangopterus – Compare to the outgroup taxon, Changchengopterus, with similar overall proportions. Manual 3.1 was the shortest phalanx. Scaphognathus crassirostris (holotype) – The metatarsus was shorter. Manual 3.2 was longer. The digits were more robust. The unguals were larger. Scaphognathus SMNS 59395 – The digits were relatively longer. Scaphognathus (Maxburg specimen) – The metatarsus was longer. The digits were shorter. The unguals were shorter. Manual 3.2 was shorter. Gmu 10157 – The metatarsus was longer. The digits were shorter. Ungual 1.1 was larger. TM 10134 – The metatarsus was more gracile. The digits were relatively smaller. Manual 2.1 and m3.1 were relatively longer. The unguals were smaller. BSp 1986 XV 132 – The metatarsus was relatively longer. The digits were much shorter with smaller unguals. No. 30 – The proximal metatarsus was more robust. The fingers were longer, but shorter than those of Gmu 10157. Cycnorhamphus – The proximal phalanges were longer. The penultimate phalanges were shorter. Yixianopterus – Compare to outgroup sister taxon TM 10134. (This data was difficult to gather and may include errors. It certainly includes some autapomorphies.) The metatarsus was more robust. Manual 1.1 was longer. As in the Maxburg specimen the penultimate phalanges were longer. Lebanon specimen (MSNM V3881) – The digits were smaller. Digit 1 was not elongated as in Yixianopterus. JZMP embryo – The digits were relatively the largest among all ornithocheirids (a possible juvenile trait?) Digits 3 and 2 nearly the same length. Haopterus – The digits were mid-sized. The unguals were smaller. The digits were more gracile. Boreopterus – The digits were relatively shorter with smaller unguals. Manual 3.2 was a disc. The unguals were larger. Zhenyuanopterus – Manual 3.1 was shorter and shorter than m2.1. Manual 3.2 was longer. Arthurdactylus -The digits were more gracile and longer with smaller unguals. Istiodactylus – Digits 1-3 were subequal and nearly identical, composed of only two phalanges (including the ungual) each, which is unique in pterosaurs. 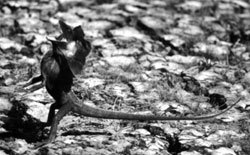 Brasileodactylus – The digits were long with larger unguals. Anhanguera – The digits were more robust. The unguals were deeper. Earlier we looked at dimorphodontid and basal eudimorphodontid hands. Today we’ll take a look at the clade that begins with the Donau specimen of Dorygnathus and ends with Pterodaustro. Figure 2. Dorygnathus to Ctenochasmatid hands. Not to scale. Click to enlarge. The trend here is to a longer metacarpus, but not coincident with the reduction of the tail. The fingers and unguals were much smaller in the beach-combing ctenochasmatids, probably indicating no further need of trees to grapple. Fenghuangopterus? (Dorygnathus species) – Compare to the outgroup taxon, Dorygnathus, the Donau specimen. Metacarpal 4 was more robust. Metacarpal 2 was subequal to mc3. Digits 2 and 3 were shorter. Manual 3.2 was no longer than wide. Dorygnathus SMNS 55886 – The digits were relatively shorter and more gracile. Dorygnathus R 156 – The metatarsus was smaller and the digits were longer with larger unguals. Manual 3.2 was longer than wide. The St/Ei 1 specimen attributed to Pterodactylus – The metatarsus was a quarter longer. Manual 3.2 was nearly as long at m3.1. Smaller unguals. The drastic reduction in the tail places this taxon in the pterodactyloid-grade, but the metacarpus was not elongated. MB.R.3530.1, No. 40 (Wellnhofer 1970) – The metacarpus was a wee bit shorter. Unguals were smaller. Ctenochasma elegans (private specimen) – The metacarpus was nearly twice as long. Manual 1.1 was shorter and subequal to m2.1. Manual 3.3 was shorter than m3.1. The unguals were reduced to no deeper than the penultimate phalanges. Ctenochasma? elegans (a small Gnathosaurus species) AMNH 5147 – The metacarpus was slightly longer. Manual 1.1 was longer. Pterodactylus? micronyx (Pester specimen) – Manual 1.1 was shorter than m2.1, which was longer than m2.2. Ctenochasma elegans No. 45 – The digits were shorter and more robust. The proximal phalanges were all subequal. Ctenochasma gracile, No. 65 – The metacarpus was longer and more gracile. The digits were more gracile. Manual 3.2 was a disc. Pterodaustro – The metacarpus was shorter with a larger wing finger joint. Digit 3 was not longer than digit 2. Pterodaustro embryo – The metacarpus was relatively shorter. The unguals were relatively larger. The smallest known pterosaur B St 1967 I 276 (No. 6 of Wellnhofer 1970 ) was discussed earlier. Today we get to meet maybe the second smallest pterosaur, Pterodactylus meyeri BMNH 42736 (Munster 1842, Fig. 1) is the same size as No. 6, but had several distinct traits (Fig. 2). I ran across the BMNH specimen in Unwin’s (2006) The Pterosaurs From Deep Time book on page 151. Dr. Unwin considered the specimen a “flapling” (= newly hatched pterosaur able to fly) with a wingspan of 17 cm, so that is the reconstructed scale (Fig. 3). It’s a shame that modern workers don’t produce reconstructions of crushed pterosaurs anymore. There is so much to see (Figs. 2, 3), especially when one compares similar specimens. Many traits would go unnoticed if left crushed. Figure 1. One of the world's smallest pterosaurs, traced from Unwin (2006, p. 151). The feet of the "flapling" were not articulated and a certain amount of guesswork was applied to the idenfication of the pedal elements and their reconstruction. Note how the left radius and ulna are parallel to and beneath the elongated right scapula. The right coracoid is largely beneath the right humerus. The left hand and proximal wing finger are beneath the right hand. Soft tissue stains are highlighted in orange. The wing had a narrow chord at the elbow. Colorizing the bones is a result of employing DGS, digital graphic segregation. Distinct from No. 6, the “flapling” had a deeper skull, more and smaller dorsal vertebrae and ribs, a longer scapula (almost touched the pelvis), a deeper and more fully fused pelvis and a larger sternal complex than either of its sisters. Considering the reconstructed differences in quadrate elevation, jugal shape and pelvis dimensions (Fig. 2), you might think the “flapling” would have nested further apart from No. 6 and No. 12. These distinctions suggest that the “flapling” may have been at the base of its own clade of currently unknown descendants. Figure 2. The tiniest pterosaurs. On the left, Unwin's "flapling" Pterodactylus meyeri BMNH 42736. On the right, B St 1967 I 276, No. 6, the former sole owner of the title. If the BMNH tiny pterosaur was indeed a juvenile of a larger more established taxon, which one did it match up to? And if so, why did it nest with other tiny pterosaurs? No. The BMNH specimen was an adult. The many autapomorphies (= differences) in the “flapling” also follow a larger trend seen in other tiny pterosaurs: morphological innovation. Figure 3. 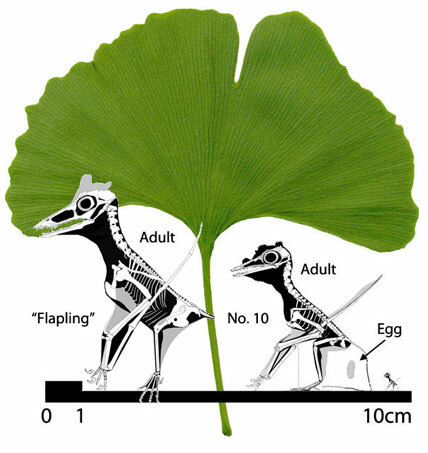 Full scale image of ginkgo leaf and the two smallest pterosaurs to scale on a 72 dpi screen. Yes, these are tiny, but just look at the size of a hatchling on the far right, no bigger than a small fly. In the BMNH “flapling” we see more substantial anteriorly-directed medial teeth forming the tip of the premaxilla. Those two teeth evolve to become one in the rostral tip of Germanodactylus. That tooth is the only one retained in so-called “toothless” pterosaurs like Pteranodon and Nyctosaurus that have sharply tipped jaws. A deeper pubis and pelvis in the BMNH specimen could have produced a larger egg. A stronger sternal complex and longer scapula could have made the “flapling” a more powerful flyer. Despite a flipped mandible and poorly preserved feet, the “flapling” is otherwise well preserved and largely articulated. A soft tissue stain can be seen (overprinted in Fig. 1) that demonstrates a narrow chord at the elbow wing membrane construction. Meyer H von 1842. Notes on labyrinthodonts and fossil reptiles, including a description of Belodon plieningeri, new gen. and sp. Neues Jahrbuch fur Mineralogie, Geologie und Palaontologie 1842, pp. 301-304. Unwin D M 2006. The Pterosaurs From Deep Time. 347 pp. New York, Pi Press. Earlier we looked at dimorphodontid and basal eudimorphodontid hands. Today we’ll take a look at the clade that begins with the Donau specimen of Dorygnathus and ends with Quetzalcoatlus. Figure 1. Dorygnathus to azhdarchid hands. Not to scale. Click to enlarge. Red arcs indicate ungual rotation to display it better. Gray arrow indicates second lineage. Dorygnathus, the Donau Specimen – compare to the outgroup taxon, Sordes. The manus was overall more gracile with a relatively shorter m3.2 and m2.1. Dorygnathus, SMNS 51827 – had a relatively shorter metacarpus. Metcarpal 2 was as long as mc 3 and mc 4. Dorygnathus, the SMNS 50164 – had an even shorter metacarpus and more robust fingers. Manual 3.1 was longer than m3.3. Pterodactylus? spectabilis, TM 10341, no. 1 in the Wellnhofer (1970) catalog – The metacarpus was no longer than in the Donau specimen. Manual 2.2 was relatively longer. The drastic reduction in the tail places this taxon in the pterodactyloid-grade, but the metacarpus was not elongated. Beipiaopterus – The metacarpus was twice as long. Manual 3.1 was relatively longer and m2.1 was shorter. CM 11426, no. 44 in the Wellnhofer (1970) catalog – The metacarpus was nearly twice as long and the fingers were less than half as long. Manual 2.1 was not shorter than m2.2. BSPG 1911 I 31, no. 42 in the Wellnhofer 1970 catalog – The fingers were longer with m3.3 not longer than m3.2. Huanhepterus – The metacarpus was relatively shorter. The fingers are unknown. Sos 2428 – Similar to Huanhepterus in the metacarpus and similar to n42 in the fingers with a slighly longer m3.3. Microtuban – Metacarpals were all subequal. Manual 3.1 was shorter than m2.1. Manual 3.2 was no longer than wide. The penultimate phalanges were shorter. Jidapterus – The metacarpus was more robust. Manual 3.3 was longer. Manual 2.1 was longer. Chaoyangopterus – Metacarpal 1 was slightly shorter than the others. The manus was more gracile. Manual 1.1 was longer. Zhejiangopterus – Metacarpals were all subequal. Manual digits 2 and 3 were similar in length. Manual 1.1, 2.1 and 3.1 were subequal. Manual 3.3 was the shortest phalanx. Quetzalcoatlus – Metacarpal 1 was perhaps slightly shorter. The digits are largely unknown but are reconstructed here based on Haenamichnus ichnites. Libby et al. (2012) introduced their abstract with this statement, “In 1969, a palaeontologist proposed (Ostrom 1969) that theropod dinosaurs used their tails as dynamic stabilizers during rapid or irregular movements, contributing to their depiction as active and agile predators.” This hypothesis has been widely accepted. Archaeopteryx is an example of such a morphology. Applicable to Fenestrasaurs and Pterosaurs? The stiff attenuated tail of Cosesaurus, Sharovipteryx, Longisquama and basal pterosaurs bears strong similarities to the tail of Archaeopteryx and dromaeosaurs, especially so in derived long-tailed pterosaurs, like Rhamphorhynchus in which the various zygopophyses and chevrons elongated and intertwined with one another in much the same fashion leaving only the proximal caudals free to move. In birds the short tail and long tail feathers may flex dorsally and ventrally to enhance balance. The same seems to hold true for fenestrasaurs and pterosaurs (as lizards themselves). Both birds and fenestrsaurs largely reduced the caudofemoralis muscles and their bony caudal anchors diminishing the ability to swing the tail left and right. Bennett (1997) proposed a leaping behavior for the origin of pterosaurs. Bennett (1997) used hypothetical models. My studies with the increasingly long-legged and bipedal pterosaur ancestors Cosesaurus, Sharovipteryx, Longisquama and MPUM 6009 confirm a leaping origin, with the addition of bipedal digitigrade locomotion (reversed in several derived pterosaurs). Libby et al. (2012) tested lizard leaping in the laboratory replicating behaviors that these fenestrasaurs likely practiced in the Triassic wild. Figure 2. Click to enlarge. The most primitive known pterosaur, the Milan specimen, MPUM 6009. In lizards and derived pterosaurs the tail was held in line with the sacrum and dorsal vertebrae, but in Longisquama and basal pterosaurs (Fig. 2) the sacrum and posterior ilium was elevated distally, at right angles to the anterior ilium. This permanently elevated the base of the tail, similar enough to long-tailed lemurs and house cats. Despite the low mass of an attenuated fenestrasaur/pterosaur tail, elevation provided tail clearance from the substrate while standing with the shoulders elevated above the hips. It also moved the center of gravity anteriorly with dynamic possibilities (flight, with a center of balance at the shoulder joint). Thirdly a vane on the tail tip in derived long-tailed pterosaurs likely provided a secondary sexual signal, as blogged earlier. Later pterosaurs reversed this early configuration, straightening out the posterior ilium and sacrum, perhaps as the proximal caudal vertebrae evolved more flexibility. An elevated tail would not have been as aerodynamic as an in-line tail so this was probably also a factor. Figure 3. 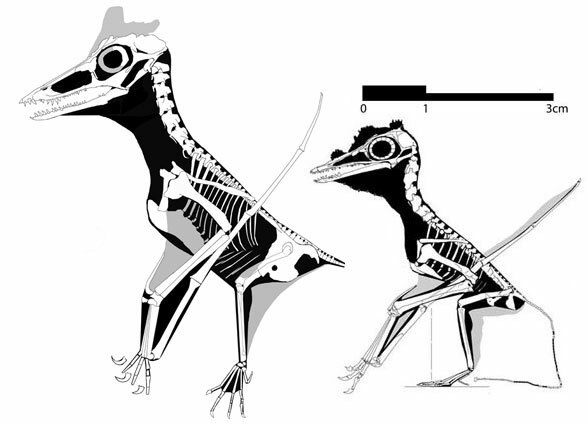 The Jayne lab documents bipedal locomotion in Callisaurus. The Bruce Jayne Lab in Cincinnati, Ohio, has produced a video of a zebra-tailed lizard (Callisaurus, Fig. 3) in fast quadrupedal and bipedal locomotion filmed on a treadmill. Note the horizontal configuration of the spine and tail, similar to the configuration reconstructed in Sharovipteryx. Compare this to the video of the basilisk (Jesus lizard) running more erect with an elevated tail, similar to the reconstruction of Longisquama (Fig. 1). Another living lizard, the Australian frilled lizard (Chlamydosaurus kingii, Fig. 4) also had an erect carriage when bipedal. Fig. 4 Chlamydosaurus, the Austrlian frill-neck lizard with an erect spine and elevated tail. Image courtesy of R. Shine, published in Peters 2000. Sharovipteryx did not have much of an elevated posterior ilium and tail (Fig. 1), but Longisquama did. The difference appears to be related to stance and problems with tail/substrate clearing due to stance. 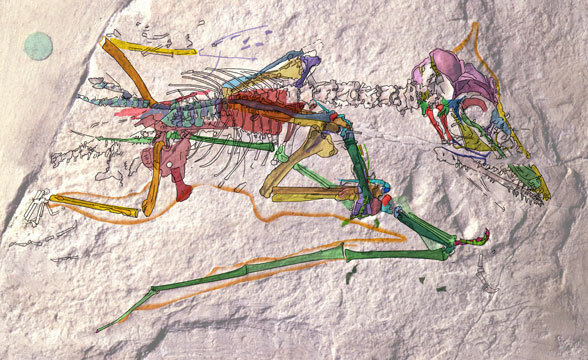 Sharovipteryx had such long hind limbs that tail clearance was not an issue. The morphology of Longisquama, with its short neck, large grasping hands and strong leaping legs has been compared to modern long-tailed lemurs, which actively leap from tree to tree and cling to vertical tree trunks. Basal pterosaurs were also likely tree clingers judging by their ability to grasp medial columns with forelimbs otherwise unable to pronate and supinate. According to cladistic analysis the reduction of the long, stiff tail in basal pterosaurs occurred by convergence three times: 1) after the proto-anurognathid MCSNB 8950; 2) after Dorygnathus (SMNS 50164); after Dorygnathus (Up R 156) and 3) after Scaphognathus (the Maxberg specimen) (Fig. 5). The last of these is the only one in which the tail demonstrates extreme reduction in length and depth. Most workers agree that subtle refinements and improvements in aerodynamic abilities elsewhere in the pterosaur anatomy reduced the need for dynamic stablization from a long, stiff tail. Figure 5. These four small to tiny pterosaurs demonstrate tail reduction following taxa having a longer and more robust tail. At some point the utility of an elongated tail diminished in pterosaurs, as it did in birds. Contra traditional stuides, tail reduction in pterosaurs appeared three times during overall size reduction in pterosaurs. Examples include the tiny Dorygnathus sisters TM 10341, St/Ei I and the tiny Scaphognathus sister, TM 13104 (Fig. 5). These reductions may be considered paedomorphic sequences in which the genes for tail lengthening and stiffening simply did not turn on as these three pterosaur clades retained embryonic traits (a flexible tail curled into a shell) earlier and earlier in their ontogenetic development. The tail of derived pterosaurs has been rarely documented, but in Pterodaustro (Codorniu 2005) a comparatively elongated tail was present. Kellner and Tomida (2000) documented the tail of Anhanguera. Young (1964) documented the tail of Dsungaripterus. Zhenyuanopterus preserved a completely articulated tail. These were all substantial tails, yet still relative vestiges. Traditional views promote the disappearance of tails in pterodactyloid-grade pterosaurs. Not so, according to these derived examples. Bennett (1987 ) described an unusual tail attributed to Pteranodon that had duplex centra capable only of elevation and depression. This tail terminated in extended parallel rods, probably representing fused duplex centra. This tail was likely too small to affect aerodynamic abilities. If present on a female, such a tiny fragile tail might have been in danger of damage during mating. Perhaps it was capable of curling over the back to permit mating without damage, co-opting the tail-assisted pitch control of its nonvolant lizard ancestors. Bennett SC 1997. The arboreal leaping theory of the origin of pterosaur flight. Historical Biology 123: 265–290. Bennett SC 1991. Morphology of the Late Cretaceous Pterosaur Pteranodon and Systematics of the Pterodactyloidea. [Volumes I & II]. Ph.D. thesis, University of Kansas, University Microfilms International/ProQuest. Bennett SC 2001. 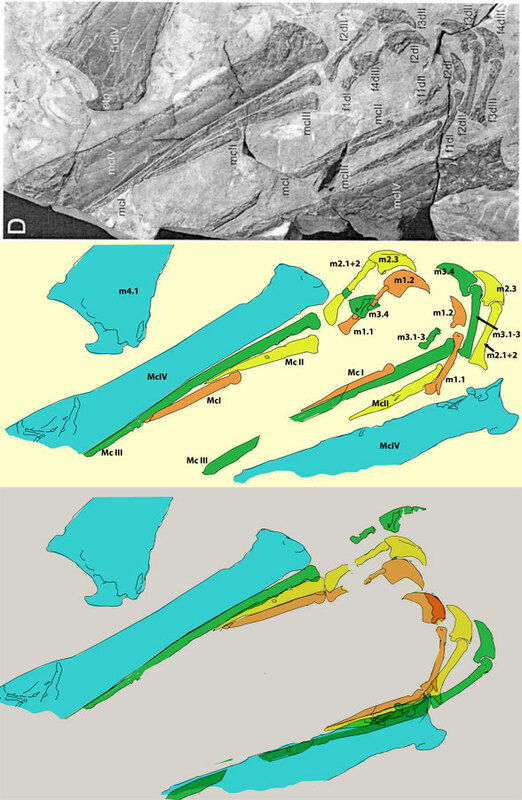 The osteology and functional morphology of the Late Cretaceous pterosaur Pteranodon. Part I. General description of osteology. Palaeontographica, Abteilung A, 260: 1–112. Part II. Functional morphology. Palaeontographica, Abteilung A, 260: 113–153. Codorniú LS 2005. Morfología caudal de Pterodaustro guinazui (Pterosauria: Ctenochasmatidae) del Cretácico de Argentina. Ameghiniana: 42 (2): versión On-line ISSN 1851-8044. Libby T, Moore TY, Chang-Siu E, Li D, Cohen DJ, Jusufi A, Full RJ 2012. Tail-assisted pitch control in lizards, robots and dinosaurs. Nature. 2012 Jan 4;481(7380):181-4. doi: 10.1038/nature10710. Ostrom JH 1969. Osteology of Deinonychus antirrhopus, an unusual theropod from the Lower Cretaceous of Montana. Bull. Peabody Mus. Nat. Hist. (Paris) 30, 68–80, 144. Young CC 1964. On a new pterosaurian from Sinkiang, China. Vertebrata PalAsiatica 8: 221-256.